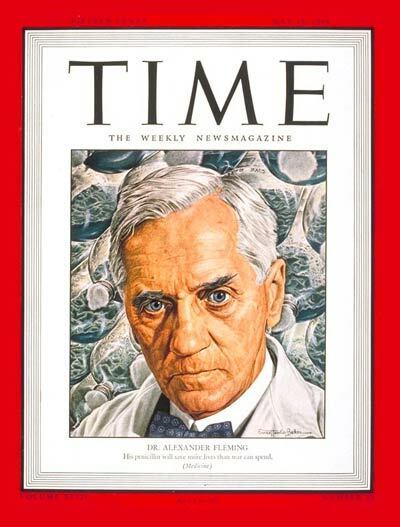 ‘His penicillin will save more lives than war can spend’ was the tagline accompanying a portrait of a serious-looking Alexander Fleming on the cover of the May 15th, 1944 issue of TIME Magazine. With his discovery of penicillin came the antibiotic era of medicine. However, when one giant rises, another must fall. Serum therapy, was almost overnight, systematically dethroned as the accepted treatment for infectious diseases. ﻿The cover of the May 15th 1944 issue of TIME magazine, which features Alexander Fleming shortly after his discovery of Penicillin (Source). Serum therapy, the treatment of an infectious disease by injection of an immunized animal’s blood serum, was first used to cure diphtheria and tuberculosis in the 1890s. The pioneers of serum therapy began by taking a dog’s serum (the yellowish substance that is left after blood has coagulated) and injecting it into a person with tuberculosis. Dogs were chosen as they are inherently resistant to tuberculosis, and it was hoped that this resistance passed to the patient1. ﻿Blood serum in a test tube. ‘It seems to act as a powerful tonic … and puts the patient in a better condition to overcome his terrible disease’ were the words of Beretta on the therapy in 1891 article. However, although it was effective for those in the early stages of disease, it only staved off infection briefly for those in the late stages of disease. It was not powerful enough. In 1895 a physician by the name of Maragliano inoculated a horse with dead bacteria (immunization). The extracted horse serum was then shown to kill bacteria in the lab, and in the first administration, 40% of the 412 patients treated showing significant improvement in their tuberculosis. Although poorly understood at the time, with modern understanding we now know that the horse’s immune system responded by making antibodies to the harmful bacteria. Antibodies are Y-shaped proteins used by the immune system to identify and neutralize pathogens, or their toxins. Every antigen (anything an antibody can bind to) binds a highly variable region of the antibody. The antibodies then present the dead bacteria to an immune cell like a lymphocyte, so the immune system can get to work, while simultaneously blocking bacterial proteins or toxins, stopping them from causing further damage. See here for more on antibody structure. Today, with the threat of antibiotic resistance looming, we are seeing antibody treatment reinstate itself into the next era of medicine. Significant developments that enable us to mass-engineer the variable antigen binding domains, screen these variants for highly efficient binding, and grow them into concentrated sera of monoclonal antibodies has occurred in recent years. With this, antibody therapy has become accepted into routine clinical practice with antibody research now at fever pitch, with thousands of published clinical trials on PubMed today. Specifically, monoclonal antibodies have incredible therapeutic potential due to the ability to explicitly bind a targeted antigen, activate an immune response, and block the causative agent simultaneously. The immunosuppressant Muromonab-CD3 given to organ transplant patients was the very first to be approved by the FDA for human use in 1985. Since its approval, many monoclonal antibodies have now been cleared for use or are advancing through clinical testing. Disease targets include Crohn’s disease, cancer, asthma, psoriasis, diabetes, HIV, influenza and Alzheimer’s disease. ﻿How antibodies structure confers specific binding. Importantly, antibody-based therapies are moving toward completely humanized monoclonals (as opposed to those sourced from mice). Research focuses on engineering low-toxicity, high target specificity and improved manufacturability – all characteristics bolstered by the advent of synthetic biology, especially massively multiplex DNA libraries. These vast libraries contain around 1010 different antibody sequences, representing every possible combination of mutations at particular points within the antibodies’ variable regions. The single set of mutations that confers perfect, high-specificity binding to an antigen of interest can then be fished out with a number of high throughput screening technologies. Such advancement has been pivotal to antibody therapy research, pushing engineering costs down, reinforcing efforts to treat complex diseases with global reach, such as cancer. In addition to DNA libraries, advances in next-generation sequencing-based diagnostics have opened new avenues for targeted, personalized, antibody-based therapies. By sequencing a tumor biopsy, it is possible to identify specific cancer-related surface antigens that are overexpressed – known as the ‘oncotype’ of the patient’s tumor. The corresponding antibody treatment can then be administered. One well-known example of a cancer-treating, FDA-approved monoclonal antibody is Herceptin – for treatment of HER2-positive (HER2+) breast cancer oncotypes. In a large fraction of aggressive breast cancers, HER2 is overexpressed, leading to accelerated cellular proliferation. Herceptin targets HER2 receptors, blocks the signaling pathway, and down-regulates growth and proliferation of tumor cells. In a 10-year study of 4,000 women with early-stage HER2+ breast cancer, treatment with Herceptin showed a 37% increase in overall survival and a 40% increase in disease-free survival compared to a cohort treated only with chemotherapy3. Herceptin binds very specifically to its cancer target, which is critical to achieve its important therapeutic benefits. However, oftentimes antigens are shared between cancer and some of the body’s own cells, causing tissue destruction. The use of synthetic biology principles and techniques for antibody engineering to ensure specific binding have come as a breakthrough in the field. Yvonne Chen of UCLA, who spoke at the recent 2015 Synthetic Biology Congress in London, discussed her research on integrating synthetic biology and antibody engineering to solve this problem. Her group engineered antibodies to contain additional binding domains – so one antibody will only have strong binding if two antigens are present. This ensures the antibodies exclusively bind to a specific cancer cell. Synthetic biology tools are revolutionizing high-throughput antibody engineering. As the cost of writing DNA decreases with new methods of DNA synthesis, the speed of development will increase. Simply, pharmaceutical and biotechnology companies will be able to test more options to improve specificity and manufacturability. In turn, this will enable highly targeted and highly beneficial therapies for the hardest-to-treat diseases, which can be delivered to patients worldwide. (3) Perez et al. Trastuzumab Plus Adjuvant Chemotherapy for Human Epidermal Growth Factor Receptor 2–Positive Breast Cancer: Planned Joint Analysis of Overall Survival From NSABP B-31 and NCCTG N9831. J. Clin. Oncol. 2014.